Starting at the age of seven with the Observer Book of Birds to identify a Waxwing eagerly feeding on the berries on our garden Cotoneaster I have remained captivated by birds and wildlife. 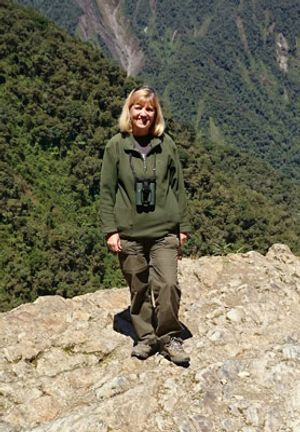 Having recently turned sixty I have travelled all over the world birding and wildlife watching in Europe. Africa, Asia, Australia, North and South America to Antarctica. Having seen nearly half the world's birds my travels continue. I have also done many pelagics worldwide with my daughter who has an interest in cetaceans. In 2010 I took early retirement from teaching and travelled the world for the whole year with my then partner Paul seeing 1700 species in, Chile, Argentina, Uruguay, South Africa, Namibia, Hong Kong, Vietnam, Cambodia, Thailand, Malaysia, Australia, New Zealand and the USA in pursuit of birds. I am currently working part-time at Titchwell Marsh RSPB in Norfolk but have also worked for Norfolk Wildlife Trust as an Education Ranger taking groups around the reserves on guided walks. I have spent many pleasurable hours watching birds in their various activities as well as helping beginners with their identification skills. The postings on this site are my own and don't necessarily represent RSPB's positions, strategies or opinions. I have taken part in many bird surveys and have spent many happy hours helping with the recent Norfolk Bird Atlas Survey work as I am an enthusiastic Norfolk birder. On many occasions I have given talks/slide shows to differing groups on my various birding trips including Antarctica. I also act as a bird guide for those wanting a day or two birding in Norfolk. I am willing to act as a bird guide at any time or give slide/talks in Norfolk for a reasonable rate.